Need sewer line replacement in NJ? At A1 sewer replacements services, our team of skilled professional NJ plumbers specialize in fast, effective sewer repairs and sewer pipe replacement service. We’re available 24/7 for serious sewer line emergencies in New Jersey, and we provide same-day service for all our drain and sewer repair services calls in north NJ. We cover a wide service area in NJ, encompassing Bergen County NJ, Morris County NJ, Union County NJ, Essex County NJ, Hudson County NJ, and Passaic County NJ. With 24-hour same-day service, 45 minute response times, and free cost estimates, we’ve established ourselves as local leaders for residential, commercial, and municipal sewer repair and sewer replacement throughout northern NJ. For effective, reliable sewer service today, call us now at 201-645-0888. Many problems with sewer main lines, like pinhole leaks, cracks, or clogs, can be fixed with hydro jetting or sewer relining. However, sometimes sewer repairs aren’t enough to resolve serious problems with an underground pipe. 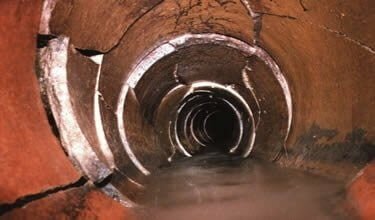 Corrosion, tree root damage, bursting, and other issues can destroy the pipe completely, leaving it with too little structural integrity to be fixed with a cure-in-place pipe liner. For severe pipe damage, sewer replacement may be the only real option. Although a typical metal or PVC sewer pipe can last for decades, they do eventually wear down and need to be replaced by a local sewer repair contractor. Sewer replacement is not needed if only a small area of your sewer line is broken, you may just need sewer spot repair excavation, digging only in the area where the sewer pipe is broken, and replacing the broken pipe. Although you need sewer excavation, it may only be for a small area of your lawn that can be easily filled in and is often cheaper and faster than the more modern technologies for sewer replacement. Pipe corrosion. Old metal sewer pipes eventually succumb to corrosion. Various chemical and biological processes inside the sewer line, like hydrogen sulfide emitted by bacteria, will gradually wear through the metal over years of use. Eventually, the damage can get bad enough that you’ll need total sewer pipe replacement. Many newer materials, like PVC and PEX, are actually resistant to bacterial corrosion. However, older cast iron and copper pipes are not. Tree root damage. Tree roots can devastate your sewer main line, even roots from a tree that’s hundreds of feet away. Pre-existing holes and cracks let moisture out into the soil, which attracts new root growth from local trees. 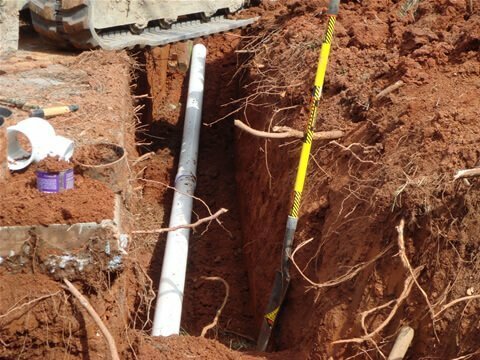 As the roots enter the sewer main line, the moist and nutrient-rich environment allows them to grow very quickly, blocking off water flow and breaking apart the pipes. Severe tree root incursion can lead to sewer line collapse, requiring sewer replacement service. Severe scale buildup. Depending on the hardness and other qualities of the local water, dissolved minerals like calcium and magnesium can gradually deposit themselves onto the walls of a sewer pipe, a phenomenon known as “scale.” These scale buildups damage the pipe walls, and can constrict water flow and cause clogging and sewer backflow. Sewer pipes afflicted by severe scale deposits will need to be replaced. Broken sewer pipe. A sewer pipe may be broken or cracked for many different reasons, including shifts in soil, weather, tree roots, age of the pipes and debris. A cracked sewer line may function with minimal interference for some time but eventually the crack will grow and result in a broken sewer line or a collapsed sewer line. There are many quick and easy trenchless methods to replace a cracked sewer line but if the sewer line that has collapsed it may need sewer line excavation. Call us today for a FREE quote on sewer pipe replacement for your new jersey home. There are a few methods we can use to replace your sewer main line if it’s seriously damaged. 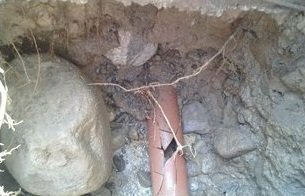 If the sewer is collapsed or there is a sewer belly, or the sewer line is old and corroded sewer repair is not an option. In those cases different methods are use to replace old sewer lines with new sewer lines. We generally need to excavate, but in some cases, we can use trenchless pipe bursting instead. Sewer excavation in nj is a highly involved process, and it’s disruptive to your lawn. However, for sewer replacement, it’s often necessary. We dig a trench to access the old pipe, which we then remove. After calculating the pitch and correct drop per foot, we can install a new sewer pipe.Afterwards, the trench is backfilled, and grass and landscaping plants can regrow. Pipe bursting is an alternative method of removing and replacing a sewer main line. If the old pipe is cracked, collapsed, or otherwise damaged beyond repair, we use a hydraulic bursting head to push apart the pipe. The fragments are pushed outward into the soil. Behind the bursting head, a cable pulls a new section of pipe into place. 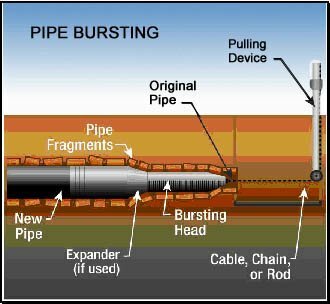 Pipe bursting requires very little excavation, but soil conditions and other considerations will determine whether it’s feasible. Trenchless sewer repair. Trenchless sewer repair is a sewer replacement method that avoids sewer excavation or digging a trench to access the sewer line. A machine is run through the sewer line and lines the sewer with a new epoxy liner coating and sealing the entire sewer line and repairing and broken sewer pipes or cracked sewer pipes. When you need to replace your sewer main line, you need licensed, experienced local NJ sewer service contractors. At A1 Sewer & Drain Services, our team of NJ sewer plumbers has decades of combined experience and training working with residential, commercial, and public wastewater systems. For quality sewer replacement or sewer repair service today, call us any time at 201-645-0888. 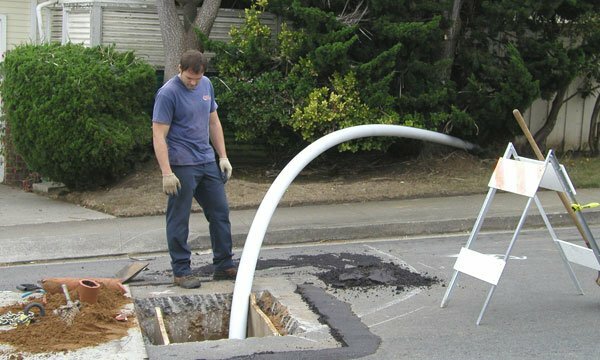 Get fast, reliable sewer replacement today from experienced NJ sewer replacment contractors.